Water picks are fancy electric flossers that you can use to get a cleaner mouth and healthier teeth and gums. There are so many of them available now, but don’t be confused! We’ve put together this handy buying guide to make sure that you make the right decision for your electric flosser. Before we get started, here are some things that you should know about electric flossers so that you know what you’re looking for when you shop. Settings: This refers to the number of settings that the water pick has, including pressure and pattern settings. This is useful for determining how many different uses and cleaning modes the pick will have, which is important, useful information. Pieces: The number of pieces may vary based on the number of different heads and inserts that come with the original package. You might get a head for every family member or else some heads that floss differently. 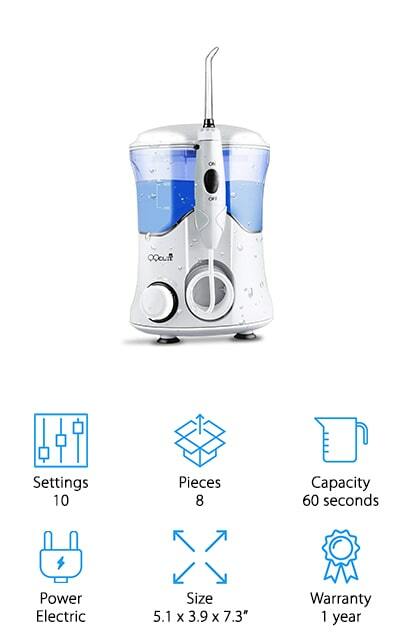 Reservoir Capacity: The reservoir capacity is either measured in milliliters or else will tell you how long the water pick will work continuously. This is a measure of how much water the tank will hold and how often to refill. Power: Does it run on batteries or off the plug? If it runs on batteries, this will tell you which type. Some of them are rechargeable, and some of them just plug into the wall with no other hardware. Size: The size of the water pick will tell you where it will fit on your counter, as well as giving you some idea of what you’re getting with your purchase. This is useful information when considering a purchase. Warranty: The warranty protects both you and your purchase so that if there are any manufacturing errors or defects you can get a full refund or replacement with no additional costs or hassle. It’s a great feature. Now that you know all there is to know about water picks, we can show you our water pick reviews. We’re presenting you with the best of the best so that you don’t have to do all of the research on your own! Check out our top pick and budget pick first, before moving on to the rest of the list. We’re sure that you’ll find your new favorite electric flosser on our list! 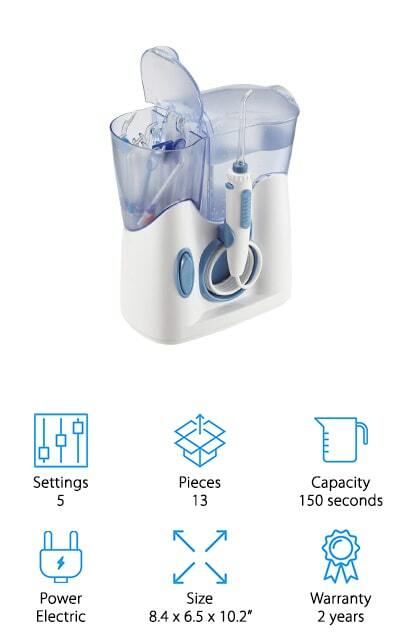 Our top pick for the best water pick for teeth is from the brand Waterpik. The WP-660 is a great flosser, excellent enough to be rewarded with the approval of the American Dental Association. 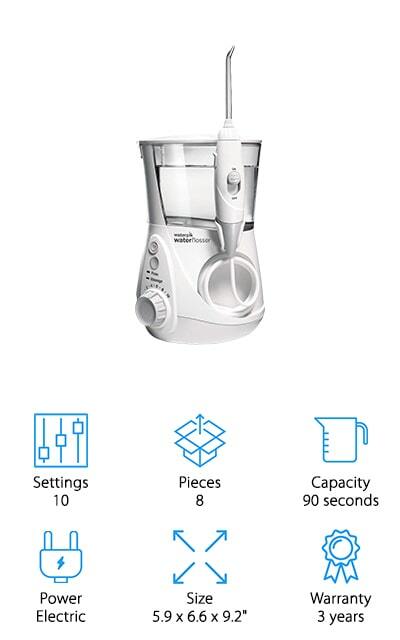 It comes equipped with ten different pressure settings so that you can get the perfect floss, as well as 7 flossing tips so you can clean your teeth your way. The reservoir is equipped to handle up to 90 solid seconds of flossing, which can lead to both healthier gums and brighter teeth over long-term use. It comes in six different colors so you can get your favorite or get the one that matches your bathroom décor. It’s a completely electric flosser that’s great for your teeth and overall oral hygiene and comes with a three-year warranty. It’s going to last you for the long haul, so why not take the first steps to improve your teeth? We know you’ll love it! H2ofloss makes the best water pick for the price – which is surprisingly affordable! It’s waterproof, so you only have to plug it into the wall to get it to work. There are five different speed settings, one of which has a 1200 pulses/minute frequency. This is one of the most comfortable speeds for thorough teeth cleaning. It comes with 12 multifunctional tips, which include tips for cleaning your tongue, tips for your nose, and jet tips as well. There’s a tip that will do just about anything. The reservoir on this model is also huge, so you can get a continuous flow of water for about 150 seconds before you’ll have to refill. We love the design of the base on this pick, which has the reservoir on one side and a place to hold all of the tips and accessories on the other! That’s pretty amazing forward thinking in the design, and we love it. 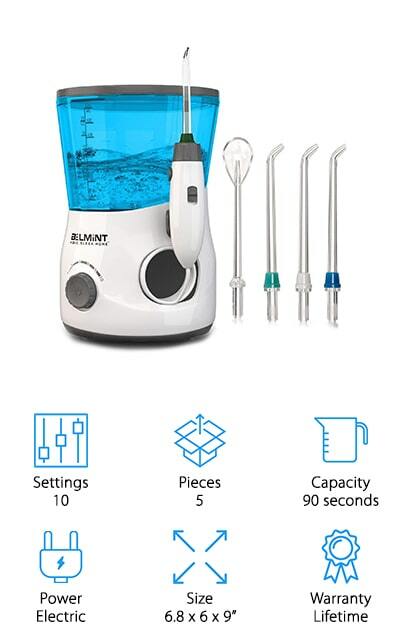 One of the top-rated water picks on our list is the Belmint Dental Water Flosser. It has ten adjustable water pressure levels, from 0 to 90 PSI and 1400 pulses per minute. You can adjust it to the water stream that best suits your teeth based on sensitivity and pressure. There are three interchangeable color-coded nozzles that you can use, all of which give you the same quality deep clean. The colors are helpful for differentiating between members of your family if you all use the same water pick. You can use the built-in knob to browse through each person’s individual preference for pressure. Cleaning your whole mouth is easier than ever, and there’s even a two-minute timer to help guide you through the flossing process. Plus, it comes with a free tongue scraper that attaches to the pick so that you can restore your very best oral hygiene! This sophisticated water pick will be great for you! 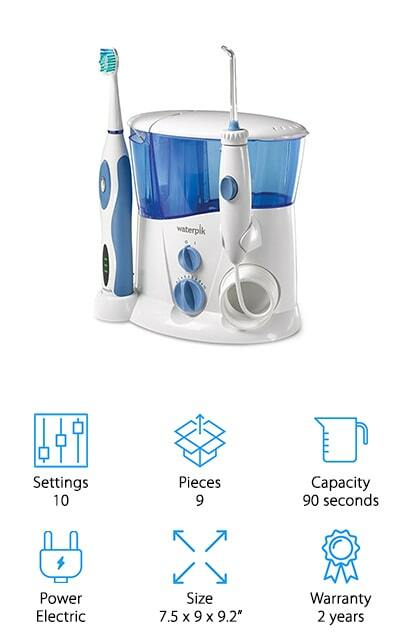 The Waterpik Complete Care Flosser is one of the best water picks for teeth that we looked at in our research. It helps to remove the debris and plaque between teeth and even below the gum line where you can’t usually get during normal teeth brushing and flossing. The water reservoir can sustain a flow of water for about 90 seconds, with a superfast bristle speed that we know you’re going to love. The toothbrush includes two speeds, a travel case, and a timer that helps you determine when you’ve brushed or flossed for long enough. It even comes with a travel case to keep everything together and to keep it from getting damaged. 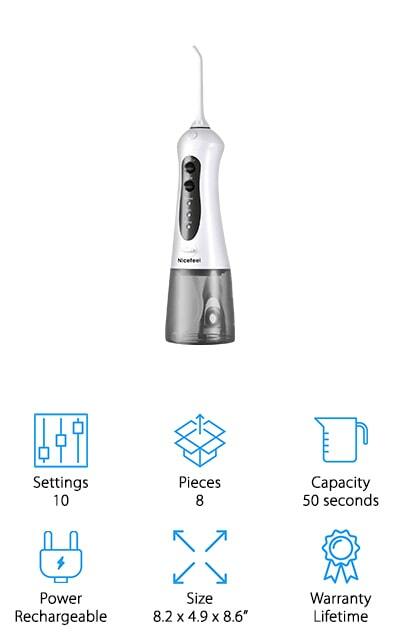 It’s an electric toothbrush that stays plugged in while you use it so that you can get a consistent speed, pressure, and clean each and every time. We love that it’s a toothbrush and a flosser both and you’re going to get the most from it! Another of the top water picks on our list is the Zerhunt Cordless flosser. It has a cleaning and massaging function, to keep your gums clean and fresh. It’s great for getting plaque out of all those hard-to-reach places and for improving the blood flow to your gums, giving you much better overall oral health. It has 1700 pulses a minute for speed, as well as a nozzle that rotates 360 degrees. It can really get into those places that you previously didn’t know could be flossed! It’s cordless and lightweight so that you aren’t chained to a wall plug in order to get your flossing done as long as the water pick has a full charge. It charges in four hours and will stay good for up to 14 days of continuous use. 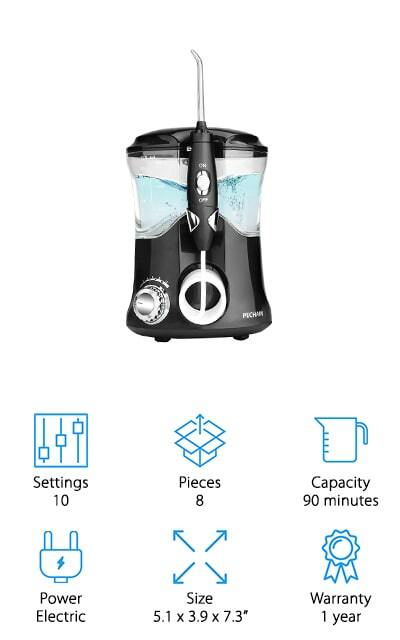 The water tank on this flosser opens completely, allowing you to clean out the unhealthy build-up on the inside of the tank! This electric water pick for teeth by PECHAM is a great tool for getting the most out of your dental health. It comes with 7 multifunctional tips that you can change onto the top of your flosser for different effects, including one that removes plaque specifically, three classic tips for interchanging, and a tongue cleaner. The water pressure adjusts between 30 and 125 PSI that’s spread over ten different pressure settings that are easy to adjust. The reservoir has a huge capacity to provide up to 90 seconds of flossing so that you can get your perfect oral health within a week of use. It plugs right into the wall so you can get a consistent speed and pulse pattern, which we love. It’s both easy and fun to use this pick, and we think it’s a great water pick for braces as well because of the level of clean that it provides. We love it! One of the best water picks for teeth that we found is this 2NICE flosser. It has a rotating knob on the side of the brush that helps to adjust the flossing angle to help you get the best clean and most effective flossing experience with little to no effort. It comes with seven different tips, including an orthodontic tip, a periodontal tip, a tip specifically for removing plaque, and a tone cleaning in addition to three of the classic tips so that the whole family can use it! Get up to 90 seconds of continuous use with the giant reservoir. 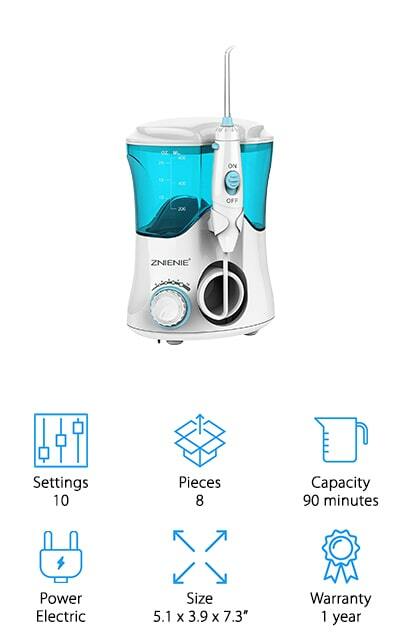 This entire device is devoted to keeping your mouth clean and fresh and giving you the best oral hygiene that you can manage. The ten levels of water pressure can help with that and give you an experience that will best suit your teeth. The personalization level is amazing, and we really appreciate the different tips! This flosser from QQCute is a great space saver. It’s small, so it won’t take up much space and you won’t have to make room on your crowded bathroom countertop. For people with specific oral problems, or even not at all, this is a great flosser so that you get the cleanest mouth possible. It reaches between teeth, under the gum line, and back into places that there’s no hope of your regular flossing string reaching. The water pressure has ten different settings and a range of 30 to 120 PSI. Choose the level that’s most comfortable for you, and the rest of your family can feel free to choose theirs as well. It comes with 7 additional tips so that your whole family can hygienically share the water pick. The water capacity allows it to run for between 60 and 90 seconds so you know where to stop, which is an amazing feature that we love. Nicefeel makes this high-powered water pick that is your best tool to clean and properly irrigate your gums! It has a 360-degree rotating nozzle and 4 jets that it uses through the flossing head to remove all of the debris from your teeth. It pulses at an amazing rate of about 1800 times a minute on the highest pressure, but there are ten different pressure settings that allow you to choose your comfort level. It’s also cordless and rechargeable so you can take it with you when you’re traveling and charge it through the USB. There are three flossing modes, including normal, soft, and pulse so that you can meet your own special oral care needs and help keeps your mouth as healthy as you can. There’s even a two-minute timer where it automatically shuts off in case you forget. It even has a storage bag that fits easily into your luggage and a universal USA adaptor! VAVA makes one of the best dental water picks and flossers that we saw during our research, including a completely removable water tank that will allow you to scrub inside and get rid of any bacteria trying to build in it. It’s great for use in the shower, which means that it’s also cordless. This is a great feature for use in other parts of the house. It’s got a 360-degree rotating tip that helps to prevent a variety of teeth issues that stem from not taking care of your teeth. What we love most about this flosser is that it’s gently while still being really effective at cleaning. It’s durable and won’t go breaking down on you any time soon! If you only use it twice a day, you can use it for about 24 days in a row on a single charge. That’s an amazing battery life, perfect for use in the RV or for traveling!